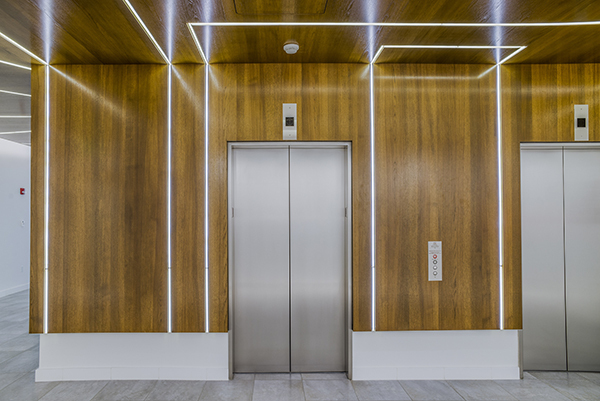 “Visual images” lined with iLight Plexineon White fixtures add excitement in the main floor elevator lobby, as well outside the elevators on each floor. 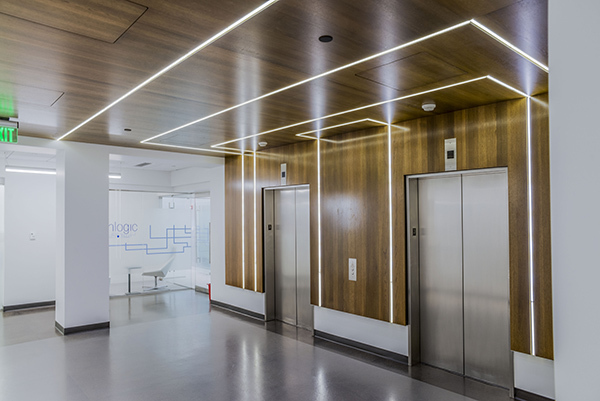 Plexineon is installed in the wall and ceiling to create a 3D effect. The three-building, 340,000-square-foot campus was formerly a dated-looking home to one large life sciences tenant. But a recent metamorphosis has transformed it into modern office and laboratory space for a variety of smaller biotech companies. To support the tenants’ breakthrough work, the firm Arrowstreet designed the common areas inside and out to be sleek and sophisticated. In one building, that includes using “visual images” lined with iLight Plexineon White fixtures. 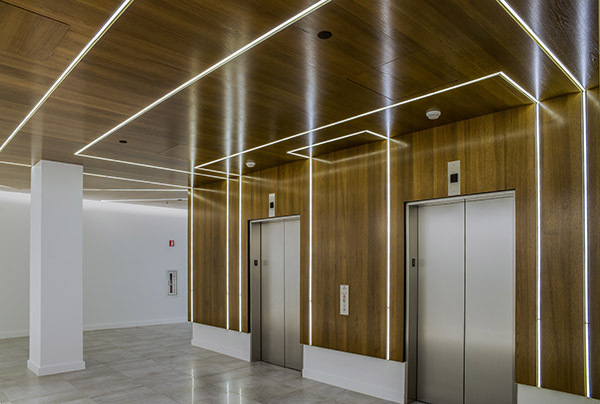 Installed so they are offset against the ceilings, the fixtures create a 3D effect in the main floor elevator lobby, as well outside the elevators on each of the building’s four floors. – D. Schweppe, Principal, Schweppe Lighting Design, Inc.
“A big issue was how to make these long, L-shaped corner spaces fun and exciting,” says D. Schweppe, principal of Schweppe Lighting Design, Inc., which collaborated with Arrowstreet. While lines of light were the goal, reflection was considered a plus because it would help create more dimension, Schweppe says. And the quality of the light is just as he expected, after using Plexineon successfully on several other projects. It was a challenge to make the long, L-shaped corner spaces fun and exciting, while also incorporating the fixtures into existing wood paneling. Plexineon’s narrow profile was consistent with the design concept to keep things clean and elegant.